Crediting the outstanding work of his Attorney Hiring Committee, Westchester County District Attorney Anthony A. Scarpino, Jr. today proudly presented the Class of 2017. 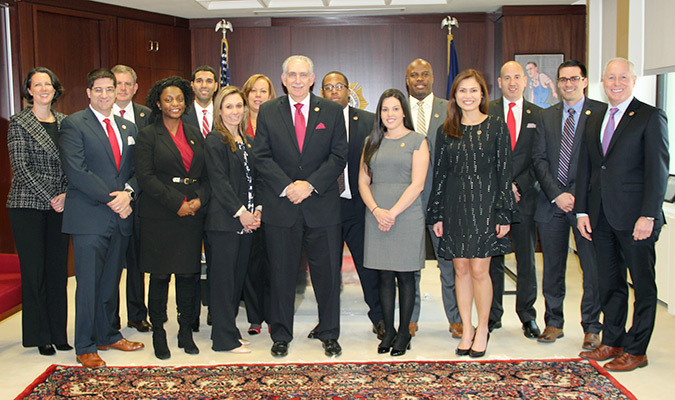 "Thanks to the efforts of our Attorney Hiring Committee, we welcomed to the Westchester County District Attorney’s Office 16 talented attorneys to join our staff of lawyers who are among the finest, most committed prosecutors in the State," DA Scarpino said. He noted that a number of those attorneys hired in 2017 bring with them years of valuable legal experience while others are recent graduates from some of the finest law schools who have elected to enter public service and serve the people of Westchester County as new prosecutors.